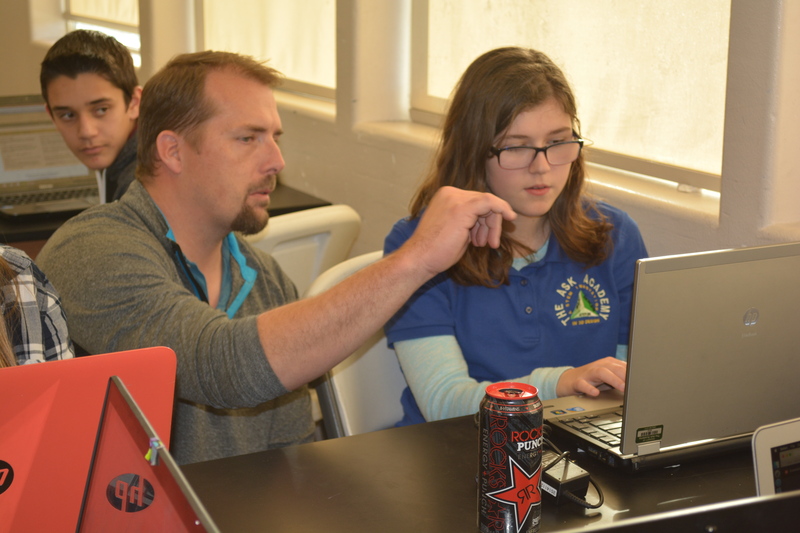 /Photo by Indiana Thompson/ Colin DeGroot, Manager of the Month, works with a scholar in his Integrated Biology/Chemistry course. Colin DeGroot, who teaches Anatomy, Bio-med, Integrated Science, Genetics, and Microbiology at ASK, was chosen as the November Manager of the Month. Scholars describe DeGroot as a super sarcastic guy who loves to go off topic during lessons. Despite loving to tease and embarrass his scholars, he forms a bond with them and wants to see them succeed. The Catalyst caught up with DeGroot to see if he would reveal his secrets. Why were you motivated to become a teacher? I was motivated to become a teacher so I could share my love of science and understanding of the natural world with others. When my parents told me to read a book as a kid I would pick books like “The Cosmos” by Carl Sagan, and that passion for sharing the wonders of nature has stayed with me as an adult. Did anyone in your family inspire you to become a teacher? My family had little to do with me becoming a teacher. Where were you before you came to ASK? I have taught at Rio Rancho Mid-High and then Rio Rancho Middle School. I have been teaching for 11 years. What do you love best about The ASK Academy? The best thing about the ASK Academy is, of course, the scholars. Many of them are very curious and have a desire to learn about their world; when they bring this into the classroom amazing things can happen. The thing I love most about my job is summers off. Of course, I usually work through summers on conferences, workshops, or trainings – but the idea is pretty nice. What do you think is the hardest part about working at the ASK Academy? There is no hardest part about working at the ASK Academy; the scholars and other project managers make the whole experience feel like fun, not work. How do your students motivate you to become a better teacher? The idea that someday I will have to rely on scholars to be the future leaders of this country motivates me every day to help produce critical thinkers with a solid understanding of science. Are you married and what is the best date you have taken your wife on? I am married and we have three wonderful kids. In our 13 years of marriage we have been on many wonderful dates, so it’s hard to pick just one. How do you balance family and work time? I don’t have to balance work and family. When I am at work I do work, when I am not at work I don’t. What went through your mind when you heard you were the Manager of the Month? I was curious why Mr. Divett didn’t win, I voted for him like 45 times. My name is pronounced Deh-Groat, like goat. I was born in Dallas, Texas. The hobbies I enjoy are golf, sports with my kids, and of course, some video games. My favorite superhero would have to be Thor, mostly because he seems to be the most probable “super” person: an advanced alien species whose science looks like magic. My favorite childhood memories were any of the times I spent outside getting dirty, playing sports, getting hurt, and exploring the world without responsibilities. It’s something I miss as an adult. I loved school, especially the summer part. What is your favorite sport, and why? Football is my favorite sport both to play and watch. It is one of the sports where true teamwork is required to win no matter how physically gifted one person is. Who were your favorite teachers when you were little? My favorite teacher was Mr. Fredrickson, he was my high school Government teacher and showed me how to completely disagree with someone in a respectful way, no matter how wrong they were. I don’t know if the lesson took, but he tried.